Once the blank is a true cylinder, a gouge is used to turn the basic profile of the bowl. This is followed by scrapers, which produce a smoother and more accurate finish. 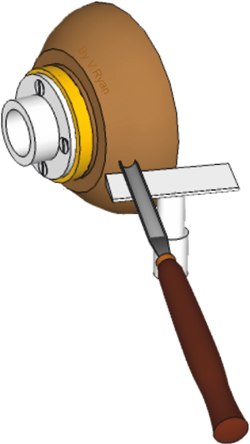 A bowl gouge is used to produce the internal shape of the bowl. The plain T-rest is replaced with a bowl turners lathe tool rest. This allows the wood turner to support the gouge / scraper, when turning the internal shape. 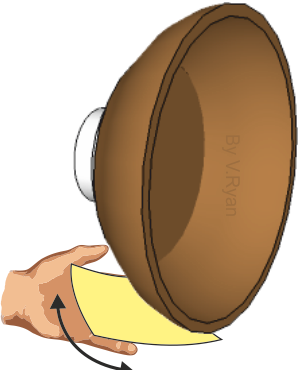 SUGGESTION: Turn the external and internal shapes of the bowl roughly to the correct size and shape. Then leave the bowl on its face plate for a week (the face plate with attached bowl, can be taken off the lathe and stored. This allows any excess moisture in the wood to escape. The bowl may warp slightly after a week of drying. However, it should not warp again, after the final turning. Suitable grades of glass paper are used to smooth the bowl. 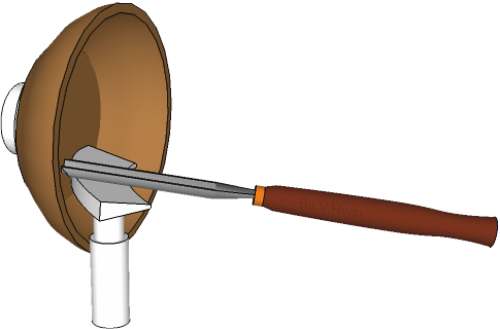 The glass paper should be held lightly against the bowl whilst it is rotating on the lathe (see the diagram opposite). Keep the glass paper moving from left to right and back again continually, otherwise the surface could be scratched.